This week, the rivalry between Boris Johnson and David Cameron was exposed again as the mayor called for an end to police cuts in the wake of the riots. As England wakes to an ugly new dawn of mindless violence and class hatred, it is tragically fitting that the two men grappling for control of the future should both be over-privileged dandies out of a bygone age. Ten years ago, the idea that either David Cameron or Boris Johnson had a chance of running the country would have been laughed out of court. Between them Harold Wilson and Ted Heath buried the Etonian prerogative 40 years ago; later, Margaret Thatcher stamped on its grave, booting the snooty "Wets" out of her cabinet one by one. The only way a blue-blood could get a line on power now was by doing a Wedgie Benn, changing his name, dropping his aitches, sending the kids to a comprehensive and embracing the far left. That change in the weather is not so remote that we cannot still get a whiff of it in Cameron's own career. Macmillan may have lamented in his old age that there were "more Estonians than Etonians" in Thatcher's cabinet, but creeping towards power in the 90s and 00s, Dave was in no doubt that his gilded upbringing was a severe handicap, when it came to following in the footsteps of Major, Hague, IDS and Howard. He rebuilt his identity no less rigorously than Tony Benn had done, cancelling his membership of White's, giving up hunting and shooting in favour of cycling, flying Ryanair, holidaying in Cornwall and proposing, preposterously, to wear a lounge suit to the royal wedding. What would the wealthy stockbroker's son not do to masquerade as a Middle Englander? Yet all the while he was being shadowed by a man whose defining attribute is shamelessness. Neither Cameron nor Johnson is exactly out of the real top drawer, unlike, say, Benn himself or William Waldegrave. Toby Young, co-producer of the drama documentary When Boris Met Dave, describes Johnson as lower-upper-middle class – fellow Old Etonian George Orwell's celebrated self-definition – and Cameron as upper-upper-middle class. Neither are they particularly English, Cameron being typically Scottish, while Johnson claims Jewish and Turkish as well as Christian ancestry. But far more than the details of pedigree, what distinguishes them is their willingness to be straightforward about who they are and the milieu they come from. Cameron, who got his foot in the door of Conservative Central Office supposedly with the help of a phone call from Buckingham Palace and then, as one Tory put it, "worked his way up on the inside, floor by floor," is as vivid and lifelike as a replicant: his public persona could have been assembled from the suggestions of a focus group. Johnson, by contrast, has been disarmingly nonchalant about his peculiar, anachronistic personality ever since he emerged into the fierce sunlight of Thatcher's approval as her favourite right-wing journalist. Like all the men on whom her favours fell, he had not only intellect but charisma. In fact if Cameron's career has been built on cold calculation, Johnson's leaps and bounds owe practically everything to natural ability. WH Auden could have written his poem In Praise of Limestone about him: "...the flirtatious male who lounges/ Against a rock in the sunlight, never doubting/ That for all his faults, he is loved; whose works are but/ Extensions of his power to charm..."
Back in 2005, when power was no more than a gleam in either man's eye, it was believed that Boris and David were good friends. Johnson's appearance as shadow minister for the Arts in Michael Howard's shadow cabinet came to grief after only a few months thanks to the "inverted pyramid of piffle" known as the Petronella Wyatt affair, but once Cameron was leader he quickly rescued him, putting him in charge of higher education. Johnson's "great stroke of luck," one journalist wrote, "was the election of his old Oxford friend David Cameron to the leadership in 2005, leading to his rehabilitation". When Boris proposed becoming the Tory candidate for London's mayor, Cameron's endorsement was again seen as the backing of a chum. The mythology of mateship has been sedulously preserved until quite recently. "Allies" of Johnson let it be known earlier this year that he remained close to both Cameron and Osborne. "Boris deals directly with David and George," the "ally" said. Boris is "no more than a text away from the Prime Minister and the Chancellor." Proof of this abiding intimacy was found in the Government's approval of funds for Crossrail, and its deferment of proposed housing benefit changes. It did the Mayor of London no harm to be seen as cosy with the Prime Minister. Yet their closeness has always been more in the eye of the beholder than in reality. Cameron's backing of Boris to be mayor was the result of desperation: there were no other candidates. But it was with the housing benefit issue that the fur began to fly. When, in October last year, the Government proposed a £21,000 cap on the benefit, to stop it being claimed by those living in opulent homes, Johnson predicted that it could lead to "Kosovo-style social cleansing". "On my watch you are not going to see thousands of families evicted from the place where they have always been living and where they have put down roots," he vowed with unwonted heat. That remark brought the "close friend" fairy story to a sudden end. Within two hours the PM's spokesman shot back, "The official line is that Boris is Boris, but he has gone too far this time. To accuse the Prime Minister of social cleansing is well over the top." Cameron, he added, was "bristling with anger". This was not the way mates should behave. Slowly it began to dawn on observers that "bristling with anger" was perhaps closer to the norm of relations between the two men than they had ever imagined; and that the impression of bosom buddies had been no more than a concocted tall tale. The froideur continued yesterday: when Boris showed up late for Wednesday morning's Cobra meeting, Cameron greeted him with a face like thunder. 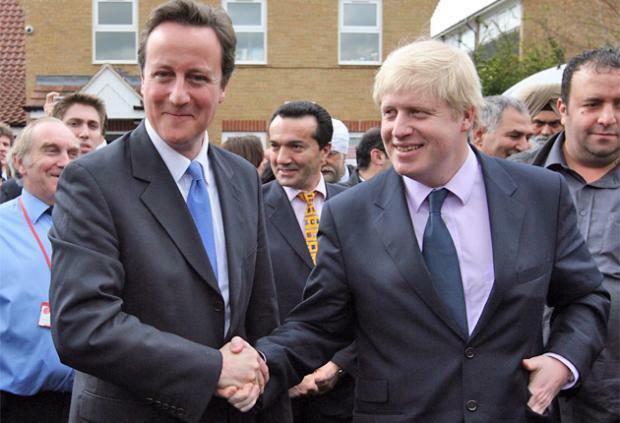 Johnson is two years older than Cameron, enough of a gap to make close friendship during the school years improbable. At Eton he was both more of an outsider and an over-achiever than the younger boy: foreign born, foreign raised and funny looking, but an academically exceptional King's Scholar, elected to Pop, Eton's elite club, like Cameron's elder brother Alex but unlike Dave. At Oxford they both joined Bullingdon, the riotous upper-class dining club, but Johnson is the one who now relishes the fact. Cameron has done all in his power to airbrush that interlude out of his CV along with the photograph of them all in white tails; Johnson is happy to burble about being chased through hedges by police dogs. Despite the privileged education they shared, no compelling evidence of real intimacy between the two men has ever been adduced. They were just too different: Cameron the straight man, the backroom boy, the cool career plotter; Johnson the odd-man-out who succeeds in making a virtue of his eccentricities, who gets his peers to accept him by being the class clown, and who goes on to build an entire life on the lovable image of clownishness. Both men are married with young children, but while David's marriage is as picture-perfect as the rest of his image, Boris, is so laid back about his alleged philandering that he is practically French. In its own way, Johnson's buffoonishness is quite as much a lie and a construction as David Cameron's claims to be Mr Average. What the Boris persona masks is fierce ambition. Comparing the two, Toby Young wrote: "Boris was the striver, the prizewinner, the boy who had to prove he belonged while David just effortlessly fitted in." Boris stood out even in his family, all of whose members are ambitious: his younger sister Rachel, novelist and editor of The Lady, said that her brother's desire as a child was to be "World King". Young says he is "by some measure the most ambitious man of his generation". But ambitious for what, precisely, other than the glittering prize for the sake of the glittering prize? Etonians in government went out of style because their vision of a Britain where wealthy, well-intentioned patricians laid down the law for the benighted plebs was already out of date even in the 1950s. Sixty years on, what kind of grotesque parody of its past is Britain re-enacting? David Cameron's vision of an England of kindly volunteers cheerfully filling the gaps left by the vanishing state seems abysmally inadequate after the events of the past days. But what more, beside his insatiable desire to be crowned World King, does Boris have to offer? If ever the opposition had an opportunity, this battle of the dinosaurs should be it.